HAU: Journal of Ethnographic Theory, is an international peer-reviewed, open-access journal which aims to situate ethnography as the prime heuristic of anthropology, and return it to the forefront of conceptual developments in the discipline. The journal is motivated by the need to reinstate ethnographic theorization in contemporary anthropology as a potent alternative to its 'explanation' or 'contextualization' by philosophical arguments, moves which have resulted in a loss of the discipline’s distinctive theoretical nerve. By drawing out its potential to critically engage and challenge Western cosmological assumptions and conceptual determinations, HAU aims to provide an exciting new arena for evaluating ethnography as a daring enterprise for 'worlding' alien terms and forms of life, by exploiting their potential for rethinking humanity and alterity. HAU takes its name from Mauss’ Spirit of the Gift, an anthropological concept that derives its theoretical potential precisely from the translational inadequations and equivocations involved in comparing the incomparable. Through their reversibility, such inferential misunderstandings invite us to explore how encounters with alterity occasion the resurgence and revisitation of indigenous knowledge practices. As an online journal, HAU stresses immediacy of publication, allowing for the timely publication and distribution of untimely ideas. Aiming to attract the most daring thinkers in the discipline, regardless of position or background, HAU also places no restriction on further publication of material published by the journal. HAU welcomes submissions that strengthen ethnographic engagement with received knowledges, and revive the vibrant themes of anthropology through debate and engagement with other disciplines and explore domains held until recently to be the province of economics, philosophy and the natural sciences. 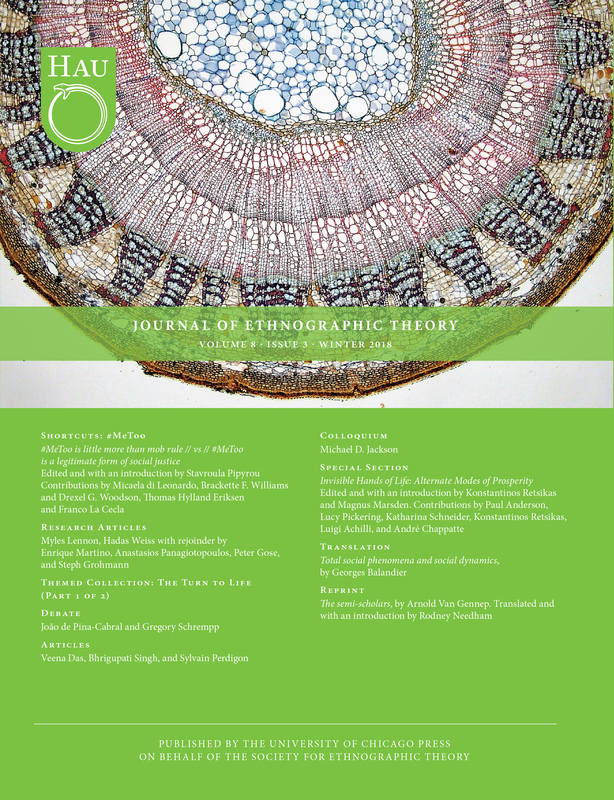 Topics addressed by the journal include indigenous ontologies and systems of knowledge, forms of human engagement and relationality, cosmology and myth, magic, witchcraft and sorcery, truth and falsehood, indigenous theories of kinship and relatedness with humans and non-humans, hierarchy, materiality, perception, environment and space, time and temporality, personhood and subjectivity, alternative metaphysics of morality. Slinging hash: Can activists and scholars play “rough music” on a one-string violin?